⋅ More than 90% of students receive some form of financial aid, including institutional aid. Merit-based scholarships are available to those who qualify. ⋅ The decision to seek financial aid does not affect a candidate’s chances for admission. Co-ed, residential, private, liberal arts college. Founded in 1946 by Walter Hendricks (student and close friend of Robert Frost). Located in the Green Mountains of southeastern Vermont—two and a half hours from Boston and 20 minutes from the Appalachian Trailt—Marlboro’s 350-acre campus includes many buildings that were originally family farm buildings. 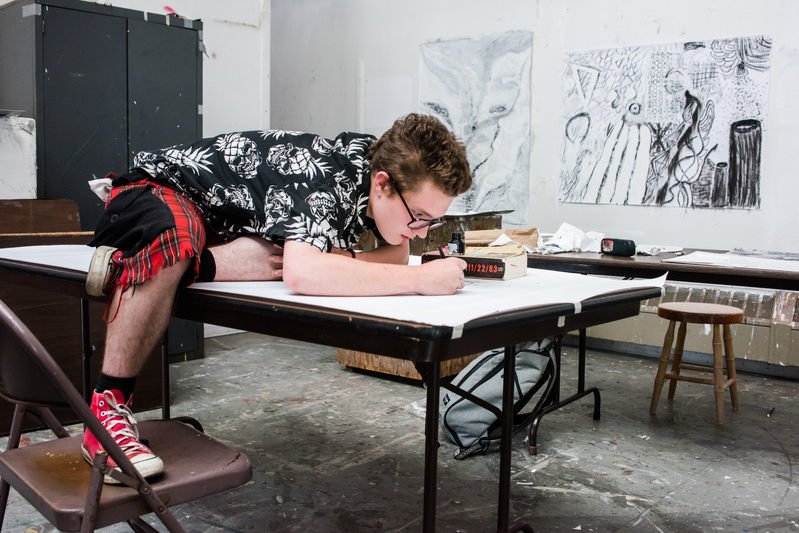 Marlboro College promotes independence by requiring students to participate in the planning of their own programs of study and to act responsibly within a self-governing community. Students complete a Plan of Concentration in a degree field offered by Marlboro. Plan is an integrated course of study designed by juniors and seniors while working closely with faculty sponsors. Marlboro offers a Bachelor of Arts or Science in International Studies degree through the World Studies Program, which has placed students in working internships in more than 50 different countries. Nearly 70% of Marlboro’s graduates go on to further study. The 10 colleges, universities or programs most frequently attended by Marlboro alumni are Antioch New England University, Harvard, Columbia, University of Vermont, Yale, Boston University, University of Massachusetts, University of California, State University of New York and Marlboro College Graduate and Professional Studies. Graduates of Marlboro College may pursue an advanced degree from Marlboro College Graduate and Professional Studies and are eligible for the Whetstone Fellowship, a scholarship for Marlboro College alumni. Marlboro offers an Accelerated Master’s Track for undergraduate students who would like to earn a master’s degree within a year or two of graduating with their bachelor’s degree. Submission of SAT or ACT scores is optional when applying. In lieu of general distribution requirements, all students must pass the Clear Writing Requirement, a twenty page portfolio of expository writing, to continue their studies at Marlboro. The goal of Marlboro College is to teach students to think clearly and to learn independently through engagement in a structured program of liberal studies. Students are expected to develop a command of concise and correct English and to strive for academic excellence informed by intellectual and artistic creativity; they are encouraged to acquire a passion for learning, discerning judgment, and a global perspective. The College promotes independence by requiring students to participate in the planning of their own programs of study and to act responsibly within a self-governing community. What is a structured program of liberal studies? Knowledge is, by its nature, diverse. Liberal studies are founded on the idea that learning progresses through various ways of knowing. The liberal arts approach to education furthers a student’s ability to more fully understand, enjoy and take meaningful action in life. At Marlboro College students are asked to engage in several ways of knowing. Particularly in the first two years but continuing through the Plan of Concentration, students are encouraged to study in various disciplines and, in doing so, engage the world from several points of view. Most colleges rely on distribution requirements to ensure that students do this. At Marlboro faculty and students collaborate through the advising process to structure individual programs of study that have, as a basic tenet, the value of broad study. 80% of students live on campus. Many campus decisions are made at weekly Town Meetings, where students, faculty, and staff each have an equal vote. The Marlboro College Outdoor Program offers regular sea kayaking, whitewater rafting, caving, climbing, and backpacking outings, along with trips to the area’s top ski resorts. Marlboro students take the lead in creating cultural offerings for the campus with plays, dance performances, concerts, and lectures. Athletic activities at Marlboro are organized by the Recreation Program, and range from organized sports to relatively untidy but thoroughly enjoyable events. Soccer is the most organized, and each fall the Marlboro team competes with other nearby colleges to the avid delight of other community members. Basketball, ultimate Frisbee, softball, and hockey, and four-square have all have had their years, depending on the level of interest, and you can usually count on a pick-up game against the staff and faculty at some point in the year. Perhaps the favorite, and bordering on chaotic, sports event is the annual broomball tournament, when teams square on a frozen campus pond to vie for the coveted “golden broom.” Other athletic activities include yoga, martial arts, and working out on the indoor climbing wall. 68% of Marlboro College students attend graduate school. Most frequently attended institutions include Antioch New England, Harvard, Columbia, The University of Vermont, and Yale.